I am very glad to say that finally the stock units have been completed. During the last two weeks I have been preparing the photo etched parts and items are now ready for the very latest preparation, which simply consists into finish the packaging process. At some points during all this latest preparations, things have not been easy, personally and with the PE units, but I tried my best to keep working on these items step by step and it is rewarding to see the completed work. I have also been working on the livery decals which I am hoping they will all be available from the store opening; decals for the A320, A320Neo and A350. On regards when the store will be open, I can give now a more clear (and assured) time, which will be at the first or second week of the next month. The reason being that I have used up all the materials I have previously aquired to prepare all these units, therefore I need this prudential time to receive more of the raw materials so that I can continue to produce more items upon store opening. I can find most of the materials I use within my area, however, after several tests, there are some special materials that works best for me that need to be purchased overseas. The second reason is that I want to do an out of box build of the Airbus A350 featuring the China Airlines Mikado pheasant livery. 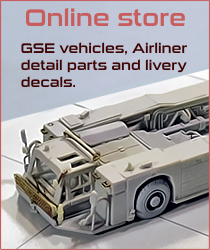 It won’t be a personal choice build (although after a long time, it will be a good practice for me) but rather a build that I intend to make in order to show how our livery decals work, to give tips and advices in a PDF file guide I am about to start and to show/explain how our interior window decals look/works. I calculated that this build will take me more or less the same time I will be awaiting for the material to arrive, so it will not be time wasted. The two areas I would like to cover in this model build guide are: painting (including 2k clear coating technique) and decaling with tips/ideas along the way, explaining things in a way considering the mistakes I made on my learning and where experience have been obtained from these. It may not be anything new for you, but hopefully it can also serve as an example of our livery decals to which Rob and myself have put a very big effort in. Stay tuned as during the next week I will be publishing some steps of this A350 build progress! (And I don’t forget all the other projects that I mentioned in previous posts, which will be started once the store is up and running after this long time of preparations).